We show every major sporting event live on television. We have cable and satellite connections from around the world. Whatever your sport, we've got your game. Food Served from 9am to midnight 7 days a week. Live music and Great entertainment at Slainte are not to be missed! So Why not join us for a Drink? Enjoy a drink, watch the game or just meet up with some friends to sample the warm and welcoming atmoshpere. Offering a relaxed, welcoming and friendly atmosphere, Slainte is a modern and elegant take on the typical Irish sports bar featuring all the main sporting events and boasting a professionally staffed creche for the little ones. Special attention to detail has been spent within the restaurant and its menu ensuring all your scrumptious traditional dishes have not been missed. 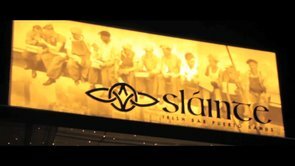 Promotional Video showing the Opening night at Slainte Irish Sports Bar. Sign up for our newsletter and get the latest news and up coming events sent to your inbox!